We all know just how important email newsletters are for businesses these days. Even if your company is just made up of yourself working from home, sending out regular newsletter campaigns is a great way to engage customers back to your company. It’s also a fantastic marketing strategy as well! Readers who enjoy your newsletter will no doubt forward it onto their friends. Even for freelancers, it’s crucial to build an email list if you want to engage with your blog readers and filter through the list to find potential clients. During the middle of this year, I’ve made more effort to send out regular emails and grow my list during different tactics. To be honest, the jury is still out whether this campaign will rake in more money to my business in the long run. 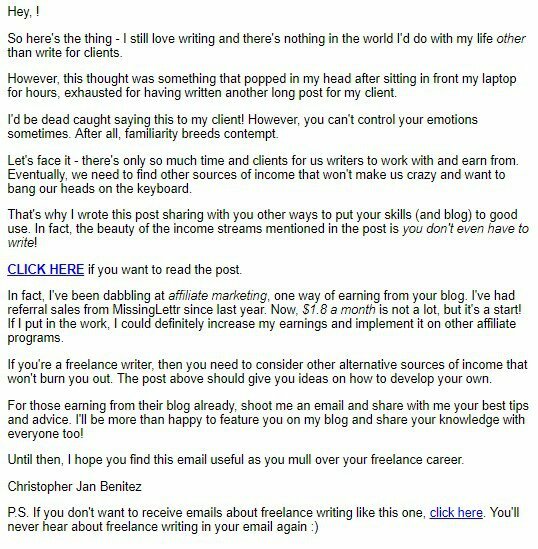 But looking at the trend so far, a more profitable freelancing career via email marketing is still on the horizon. However, your emails won’t be as effective if they aren’t written well. There are also important elements and features that you need to include in your newsletters. If you forget, the ones you send out might not bring you the benefits you expect. Key to making your email campaign work is to learn how to make email newsletters that people open. Therefore, make sure to implement the features below the next time you launch an email campaign. 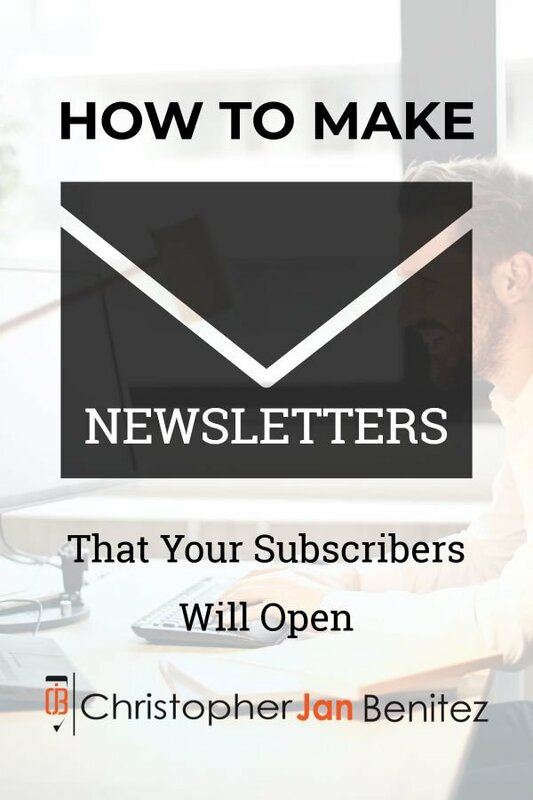 Do you now know how to make emails newsletters the right way? I know most of you would claim their love for MailChimp. After all, it’s one of the most trusted email tools with an easy-to-use interface and drag-and-drop email and landing page builders. Most importantly, you get to enjoy its core features for free (until you hit the 2,000 subscriber count). 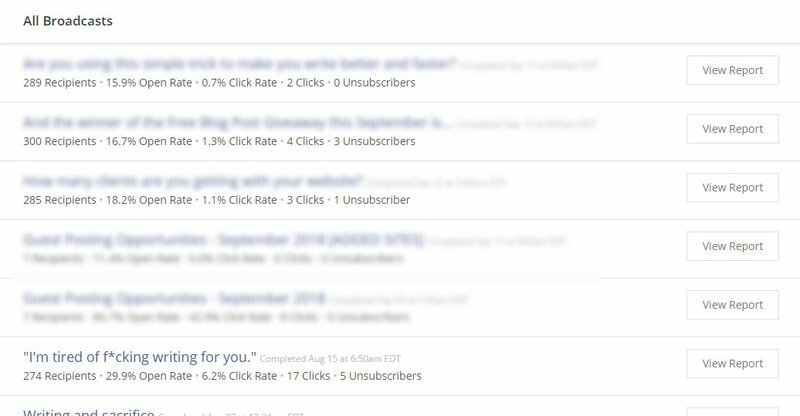 I have been using MailChimp for years to build my list. It’s been a fun ride and helped me collect emails from interested readers and client. However, I feel that I could do better with my email strategy. The thing I liked the least about MailChimp is how it’s more geared towards e-commerce than bloggers and content creators like myself. I appreciate that they offer Google remarketing and Facebook/Instagram ad features, as well as abandoned cart emails and more. However, they don’t apply to my business. While MailChimp’s core features remain useful, I still feel the need to find another platform to help me with my email needs. And I think I found my platform with ConvertKit*. Beautiful forms – Build high-converting opt-in forms and customize its behavior. Make them appear before visitors exit your page or after their scoll up until the certain part of the page. Track the conversion rate on the dashboard and find ways to improve its performance. Ability to create incentive emails – From the form, you can attach content upgrades that people will receive after filling out the form and confirming their subscription. Incentive emails makes list building much easier because it gives them a good reason to sign up to your list in the form of a freebie. Tag-based subscription – You can append tags to each of your subscribers to represent their interests. Refer to the tags to send them emails they want to read, thus decreasing unsubscribers and increasing engagement. Easiest marketing automation for me – Build an automation workflow from the campaigns you’ve created using its visual builder. Send emails to subscribers automatically and engage with them even while you sleep! Here’s a screenshot of my subscriber growth on ConvertKit. It’s been trending upward ever since I started using it a couple of months ago. The figures aren’t much, but it’s a start! Now, I’m not saying that you should go for ConvertKit. My point is you need to find an email platform that you’re comfortable using. Whether that’s MailChimp or some other email tool, the important thing is to find one that works best for you. The email tool will make your job much easier so you only worry about the message you want to impart to subscribers. You need to ensure that everyone who receives the email in their inbox is going to click on it. There’s one way to make sure they are persuaded to click on it – you need to add an enticing subject. Ideally, the subject needs to be punchy and, if possible, include a very short summary of the subject of the newsletter. To try and be even more persuasive, you might even want to add something that is click-bait-y, such as a pun or a cliffhanger that will be answered when the reader checks out the email. I’m not the biggest fan of click-bait headlines, but if it’s part of the bigger message you’re trying to communicate to readers, then might as well use it. For example, I used the headline “”I’m tired of f*cking writing for you.”” to share my experiences of writing for clients and that I need to create different revenue streams for me so I won’t feel overworked all the time. In hindsight, it was a very risky headline that will offen some of my clients who subscribed to my list. But I sent it anyway, just to see how it works. It also had the highest CTR and the most unsubscribers among my email newsletters. Take it for what it’s worth – it definitely grabbed people’s attention! As mentioned, click-bait headlines have its pros and cons. Therefore, you need to weigh all those factors before clicking the “Send” button so you know what you’re doing. There needs to be a clear focus to your newsletter, such as a topic or subject that is discussed in it. If you don’t have one, then the whole content might not seem to have any real purpose and the reader might come away frustrated that they didn’t learn anything or receive any benefit from reading the email. So, make sure the email has an overall theme and a specific purpose that will be beneficial to all readers. A great way to start is by coming up with a single call to action. For instance, if you want people to click on a link, then make sure it’s the only thing people can click on the body of your email. Next, you need to concentrate on the actual words you use in your newsletters. Your copy needs to be interesting and engaging or else your readers will simply switch off and they won’t take away the message that you have for them. If you struggle with writing engaging content, you might want to outsource this part to a professional copywriter. There are some easy ways you can improve your writing and make it jump off the page, such as by writing in the active voice and talking directly to the reader. Personally, it works to just be yourself especially since you’re already a writer. The reason they signed up to your list in the first place is because they liked what they read from me. By simply maintaining consistency in your writing, you will be able to build better relations with them. So, make sure you add a link to your target page. It all goes back to having a clear focus on your email newsletter. By establishing your purpose which in this case is getting subscribers to click to your site, you can maximize the number of clicks to it. I personally don’t advise any other links outside your call to action on your email. Some would include links to their social media pages and whatnot. 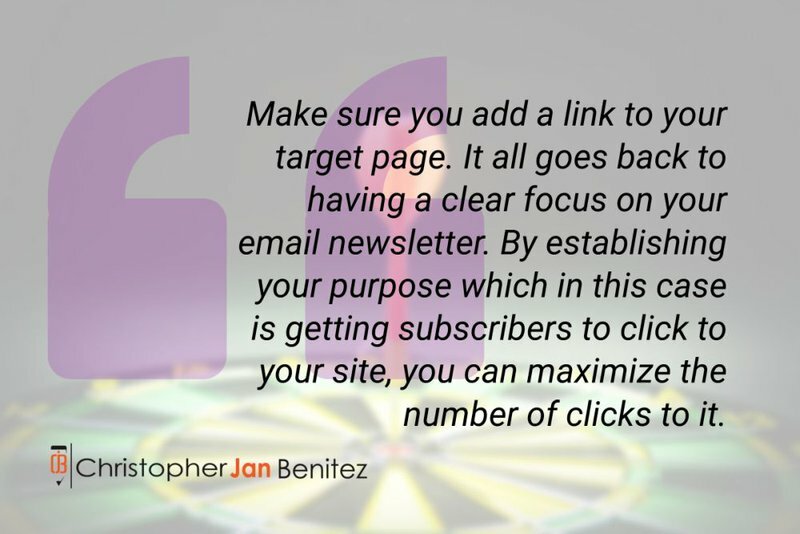 Doing so takes away the attention to the focus of your email, thus potentially lowering your click-through rate. Also, having lots of links may cause deliverability issues to your email. There’s a chance that some of your subscribers won’t see the email because it went straight to the spam folder, no thanks to the volume of links you included. Don’t forget to also add all of your business contact information. This should include your phone number, email address, and physical address. Most email marketers place this at the bottom of the newsletter. Then, if a reader wants to contact you for any reason, they have easy access to all of your information and don’t have to go to the brother of navigating to your website for it. As a result, they may be much more inclined to contact you. Also, you might want to leave an option for readers to leave you feedback. You can always use net promoter score software to add a survey to the end of your newsletter. You can edit the survey so that your readers can leave you feedback on a range of topics, such as how informative they thought the email was. Using all of the data that you collect from these surveys, you can then make necessary improvements to keep your customers happy. When writing your email content, it’s usually a good idea to try to break the content up as much as possible. Writing short, one-liner paragraphs is one way of approaching this. Another is to use bullet points. Some of your readers won’t have much time on their hands and will only be able to skim-read your newsletters. Formatting them in bullet points makes it much easier to skim-read as all of the important information is easier to pick out. 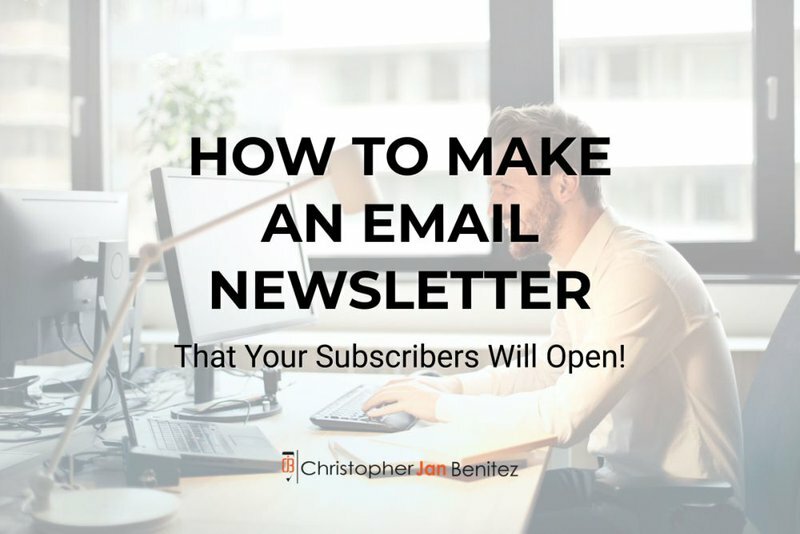 You will probably find that more people are inclined to read the newsletter in full too, as bullet points aren’t quite as daunting as large chunks of text. One further way to make your email newsletter as engaging as possible is to format them with plenty of images and photos. These can help to illustrate your points and can be used to break up all the text. However, you shouldn’t stick with just photos. It’s advisable to use as much mixed media as possible, as this will make your emails even more interesting. You’ll be able to embed videos from YouTube, as an example. Or, why not go one step further, and start filming your own videos!? Let’s face it -writing effective emails are hard as nails. It’s one thing to get subscribers to click on your email from their inbox. It’s another for them to read your email and commit to your call to action. To ensure that they follow through with your call to action, you need to ensure that all parts of your email are firing on all cylinders. Not to mention, all elements should act towards a single focus to squeeze the most engagement from your emails. Therefore, including all the elements mentioned above may not be enough to encourage people to engage with you via email. You must use the elements that will produce the most value for your subscribers consistently. From here, they will seek out your emails over time so you can engage with your readers and clients in the way you want them to! Thanks for reading my post about how to make email newsletters! Please feel free to comment below if you have questions or reactions about the post you want to share. Also, if you like to receive more of these articles straight to your inbox, please fill out the form below.